If you use the free website hosting on toastmost.org, which is part of the WordPress for Toastmasters project, you may eventually want to graduate to hosting at your own domain. There are tradeoffs (more responsibility for technical details), but you also get more control over the site setup and potentially a branding advantage from hosting at your own domain. For example, my home club, Club Awesome, is clubawesome.org. Toastmost sites all have a subdomain address like op.toastmost.org for my own beloved Online Presenters Toastmasters. Get yourself a new WordPress website, which might cost you a couple of hundred dollars a year from any reputable web host. (It can’t be a free WordPress.com site because it won’t allow you to install the WordPress for Toastmasters software). Install and activate the RSVPMaker and RSVPMaker for Toastmasters plugins on your new website. I recommend you also install and activate any of the other optional plugins you have been using because if they’re not active, that can cause problems with the import process. Optionally, also install the Lectern theme and select one of the standard Toastmasters International approved logo banner images. Transfer your member account and speech record data from your toastmost.org site to your new site (explained below). Export your website content from your toastmost.org site and import into the new site (explained below). Way down the end of the Toastmasters menu on the administrator’s dashboard is an Import / Export screen, which among other things allows you to export summary member data to a spreadsheet. A recent addition to that screen is a new feature for transferring member accounts to another computer. Rather than having you download a file from one site and upload it into another, this is set up so you can transfer the files directly from one site to another. You do this by copying a coded link from the old site to the new site. The code that allows you (or another webmaster you are working with) to copy over the member data expires after 24 hours. You can reset it if necessary. Copying the coded link for transfer between websites. This does NOT copy over passwords, so one chore when you start actively using your new site will be resetting member passwords. There is a section of the Add Members screen that allows you to “re-send” invitations to members, which you can use for that purpose. WordPress provides a standard mechanism for downloading an export file from one site and importing it into another. I recommend using a modified version of that approach. The size of the export file often exceed the file upload limit on the target new website. RSVPMaker event posts may not import properly, and this is particularly true of multiple events with the same title (like your weekly meeting agendas), which it thinks are duplicates. I recommend using the Export RSVPMaker screen under the Tools menu instead of the standard Export screen. If you export your RSVPMaker posts using this method, then import them using the standard WordPress import screen, they will come over to your new site properly. The default is to copy over future posts, templates, and other special documents (like agenda layouts) but not past events. Optionally, you can also export your standard WordPress content (pages, posts, menus etc.) at the same time. In the process, you can specify a file size limit so you will not exceed the file upload limit of your new site. The export feature will generate several smaller export files rather than exceed that limit. To import from a WordPress export file (WXR) into a WordPress blog follow these steps. Go to Tools → Import in the blog’s Administration Screen. The order stated above is important. You want your user/member accounts set up on the new site before you import content. As part of the import process, WordPress will prompt you to specify which authors from the old site should be associated with which user accounts on the new site. The “Download and import file attachments” option mentioned above should work to copy over images and other files in your media library such as PDFs. However, it doesn’t necessarily automatically change the links or image urls in your blog posts and pages. I’m trying to do my part to make this as easy as possible, but there is still work involved. To run a well-organized meeting, one important pre-meeting task is confirming members with roles and contacting members who do not have an assigned role to ask them if they can fill an opening. Broadcasting the agenda to your list can be helpful, but often contacting specific individuals is more effective. For help with that chore, you can use the Agenda with Contacts view of your meeting agenda. This feature has been in the software for some time, but is probably used less than it ought to be. I recently updated it to work with the new agenda editor and to display the planned absences list if you are using that feature. You will find this option under the Agenda menu. This displays a listing of your meeting roles with not only the names of the members assigned to those roles but their contact information. (Encourage your members to check that the contact information on their profile is correct). If you click the Email to me link, this information will be emailed to the address in your own user profile. I often use that feature to get the information onto my smartphone, which makes it easier for me to call or text message the members I want to reach. Following all the meeting roles and assignments, you will find the listing of planned absences (where members have proactively recorded that they will miss one or more meetings) and the list of members without a role. The listing of who is absent and who does not have an assignment. These are updated instructions on how to create and edit the marketing content for your website using the WordPress editor. These instructions are specific to the new Gutenberg editor, known as Gutenberg, which is active today on the Toastmost.org club websites hosted as part of the WordPress for Toastmasters project and will become standard across all WordPress sites with the release of WordPress 5.0. The idea behind Gutenberg is to organize documents around “blocks” of content and provide specialized editors for paragraph blocks versus heading blocks versus image blocks and so on. 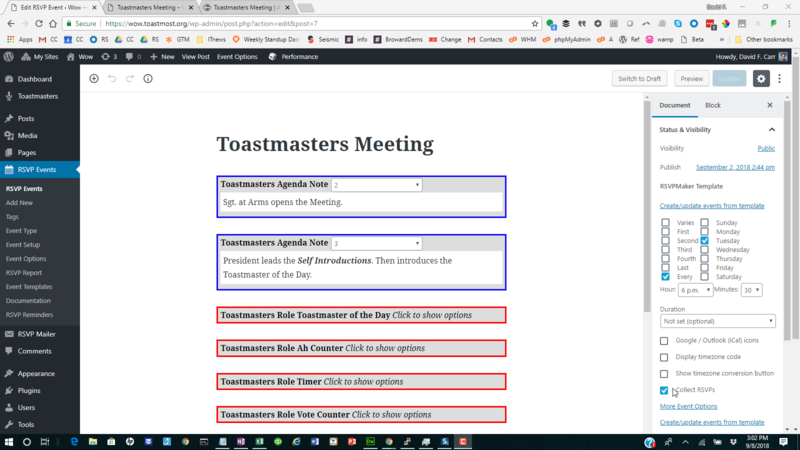 WordPress for Toastmasters takes advantage of this approach in its new agenda editor, with special blocks for meeting roles. However, here I’m concentrating on the tools you will use to customize your home page and create blog posts that tell the story of what makes your club special. WordPress for Toastmasters helps you plan the time allowed for speakers, Table Topics, and every other phase of your meeting. You can plan your standard meeting agenda around these time allowances, but you can also tweak the timing for an individual meeting. Someone is giving an extended speech, which means you will not be able to fit as many other speeches into your agenda. So you change your agenda from 3 speeches and 3 evaluators to 2 and 2. Your meeting is tomorrow, and you only have 2 speeches rather than the usual 3. So again, you want to change the number of speeches and evaluators. You will also allow extra time for Table Topics. The video below shows a technique that requires you to be using the new agenda format (new as of late summer 2018). You make adjustments by going into Edit Signups mode, which means you can do it at the same time that you are recording other changes to your agenda for a specific week. I also show how you can apply this tool to planning your standard agenda template. This is the new agenda editor, introduced summer of 2018, which takes advantage of the new “Gutenberg” editor for WordPress. The new Gutenberg editor is active on all Toastmost.org club websites. It will become the default editor with WordPress 5.0 and meanwhile is available as a WordPress plugin. If you are running an independent website, outside of toastmost.org, you will need to install and activate that plugin to get access to the features shown here. Or wait for WordPress 5.0, which should be released soon. If you previously created your agendas with the pre-Gutenberg editor (the “classic” editor), you should see a prompt to upgrade your meeting template on the WordPress dashboard. Click the Convert Now link for an automated conversion — then check whether you need to make any further adjustments before updating the specific meeting agendas based on your template. The Gutenberg editor is organized around “blocks” of content. Paragraphs, headings, images, and embedded media such as YouTube videos are all blocks. For meeting agendas, we have our own blocks. Time Allowed: The total time allowed for those who sign up for this role. For three speakers, you would set this to 21 at a minimum (3 7-minute speeches) but might want to go to 24 or 26 to allow for some longer speeches. If too many members sign up for long speeches that would exceed this limit, a warning will be shown. Padding Time: This was intended for use in combination with speech roles. In addition to the time allowed for speakers, you can build in another minute or two for introductions and set up between speeches. Agenda Note: You can enter an additional explanatory note that will be displayed on your agenda, beneath the role. An Agenda Note is a block of text that appears only on the agenda, not on your signup form. It includes basic formatting controls. Each of these “stage directions” notes can also have time associated with it. A few other Toastmasters block types are available to you, including Signup Note (appears only on the signup form, not on the agenda), Editable Note (can be changed for each meeting to show content such as meeting theme or word of the day), and Toastmasters Absences (adds a button on the signup form people can click to record that they expect to miss a meeting). The Toastmost.org club website hosting service has already switched to the new WordPress editor, known as Gutenberg, which will become standard when WordPress 5.0 is released very soon. 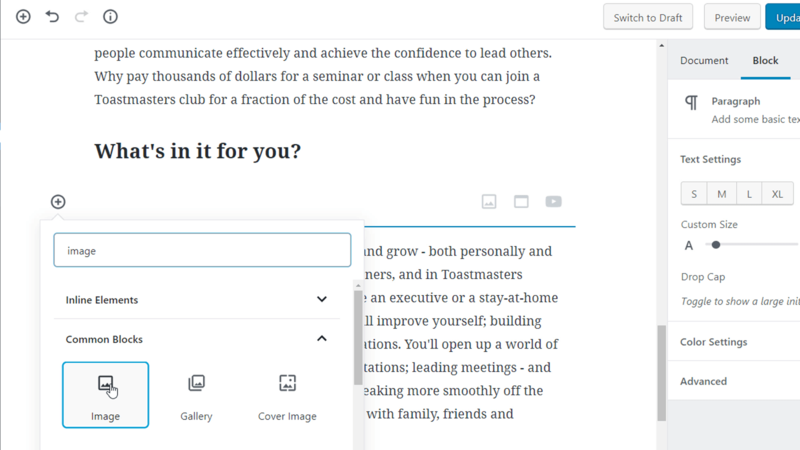 The revamped editor is one of the biggest changes to come to the WordPress publishing platform — and fortunately a very positive one for the WordPress for Toastmasters solution. To take advantage of the latest features, you will need to convert the content of your agenda template (and the specific meeting agendas based on that template) to a new format. If you are on Toastmost, or if you install the Gutenberg plugin (or WordPress 5.0, when it’s available), you will see a prompt to convert your agenda when you log into the administrative dashboard. The convert your agenda template prompt. Edit your regular agenda template (the automated conversion is not guaranteed to be perfect). Update your agendas for individual dates. You will want to update because new features will be coming to the new agenda format that will not necessarily work with the old format. For example, here’s a nifty tool that allows you to edit the time allocated to different parts of your meeting and see the effects of those changes. It also addresses a common scenario I’ve encountered in my clubs where you want to adjust the number of speakers and evaluators for a given meeting because someone is giving a longer speech. I created two videos to show off the new editor. The first covers how to work with the new WordPress editor in general, when creating the content to market your Toastmasters club. The second goes into more detail about editing your agenda — blocking out roles, stage directions, and the time required for each portion of your meeting. Agendas and content you created in the pre-Gutenberg era should still display and function properly, but will be more awkward to work with. In the case of old blog posts and home page content, you will see them displayed within a special block type labeled “Classic” for the “classic” WordPress editor. You can upgrade such content by clicking the 3-dots menu button and choosing Convert to Blocks. Do not do that for agenda content — follow the Convert Templates prompt on the administrator’s dashboard described earlier in this post. In Gutenberg, agenda templates created with the classic editor will show up with more coding than most non-programmers are comfortable with. You could still edit these by manually tweaking the content of the agenda role and agenda note placeholders (“shortcodes”), but you’ll have a better experience and unlock new features if you upgrade. Agenda in the old format. Below, I’m including a replay of my tutorial video from Aug. 18, 2018, but first I’d like to share a follow up video that covers a few refinements I made after that session was over. The WordPress for Toastmasters project is all about free software and free services for Toastmasters clubs, but it’s still true that “there ain’t no free lunch” — we have web hosting bills to pay. Do you have a product or service or a message to promote? Or can you introduce us to someone who does? You can purchase a sidebar ad, as shown below, starting at $100 for one month. The more exclusive Premier Sponsor level is $400. SpeakerPromos.com became our first “Premier Sponsor” in return to preferred ad placement on wp4toastmasters.com and the toastmost.org network of free club websites. We only have one Premier Sponsor at a time, and the opportunity is open now. Thank you to SpeakerPromos.com for agreeing to be our first “Premier Sponsor” in return to preferred ad placement on this website and the toastmost.org network of free club websites. We only have one Premier Sponsor at a time, and the next opportunity opens on Sept. 15. You can also purchase just a sidebar ad, starting at $100 for one month. You can see some of this in action on sites like the one for Online Presenters, but I’m including some screenshot examples to help you visualize the whole package. You can sign up on the sponsorship page or contact me with questions at david@wp4toastmasters.com. Here’s a glimpse of three months worth of traffic to the toastmost.org network (May – August 2018) according to Google Analytics. 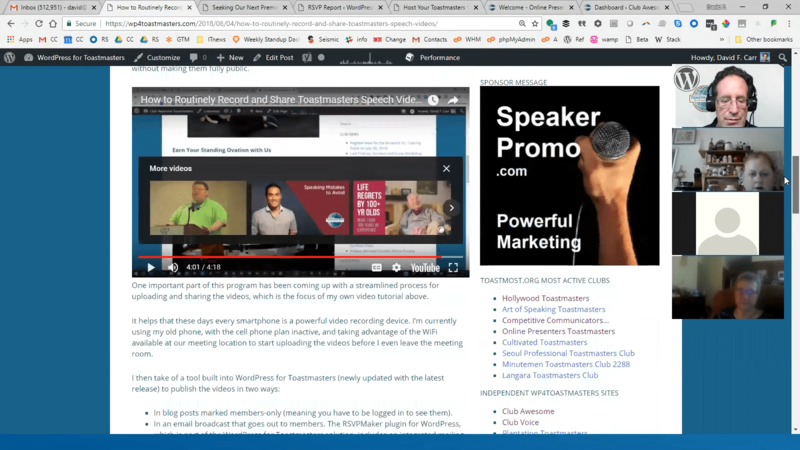 Your ad would also appear on the WordPress for Toastmasters site used as the documentation and marketing hub for this project, which gets between 500 and 2,000 views per month. Finally, these charts from a presentation I did a few months ago try to show something about the growth of Toastmost.org in terms of clubs setting up websites (at least on a trial basis) and creating user accounts for their members. Growth in active use, measured by members signing up for roles. Toastmasters World Champions and other top speakers will tell you one of the best ways to improve is to record your speeches, watch them, and make adjustments so that you keep getting laughs where you want them and driving your points home more clearly. Watching yourself on video is just as valuable, maybe even more so, for beginning speakers trying to gain control over their body language and their ums and ahs. One of my biggest contributions to my home club, Club Awesome, has been to make video recording of speeches a routine part of our program. We have videographer as a regular meeting role, and the person serving in it makes a brief speech about the purpose or the recordings (educational first and foremost) and how to opt out if you do not want to be recorded. Because this is now an established part of our club culture, something that guests see when they first visit us, we rarely have anyone opt out. We publish the videos on YouTube, but tag them as “unlisted” so they don’t show up for strangers browsing or searching the site. We only make them public with the speaker’s permission — usually, if they’re really good and we want to share them as part of our web and social media marketing. But speakers can easily share the videos with family members, even without making them fully public. One important part of this program has been coming up with a streamlined process for uploading and sharing the videos, which is the focus of my own video tutorial above. It helps that these days every smartphone is a powerful video recording device. I’m currently using my old phone, with the cell phone plan inactive, and taking advantage of the WiFi available at our meeting location to start uploading the videos before I even leave the meeting room. In blog posts marked members-only (meaning you have to be logged in to see them). In an email broadcast that goes out to members. The RSVPMaker plugin for WordPress, which is part of the WordPress for Toastmasters solution, includes an integrated mailing utility. I’ve set up the software to make it easy to pull in a listing of recent speeches with all the detail that was included on the meeting agenda (such as speech title and project) and associate those with YouTube links. Focus the camera on the person speaking, not their slides (if any). The image the camera captures of slides projected on a screen is not likely to be great. In the few cases where it’s important for the projected images to be shown to the video viewing audience, I’ve spliced them in later. That may be a topic for a future tutorial. If you’re using a smartphone or any equipment that is short of a professional setup, positioning the camera as close as practical to the speaker is important for quality audio. Audio is one of the most important elements of any video, but particularly a speech video where you want to be able to hear the speaker clearly. If you’re recording something like a contest, you’ll need a front row seat. Fortunately, smartphone audio pickup and audio processing to pick up voices has gotten pretty good. A directional microphone could be one way of improving audio quality if you can’t be close to the speaker. Or if there is a sound system and you can either get a feed from the sound system or a recording that you can sync later with the audio track, that might be better yet. I’ve never gotten that fancy. When recording contests with a smartphone, I’ve occasionally gotten critiqued by people with more professional video experience about the quality of those productions, particularly the audio. If the critics would volunteer to do the job and do it better, I’d be happy to let them. 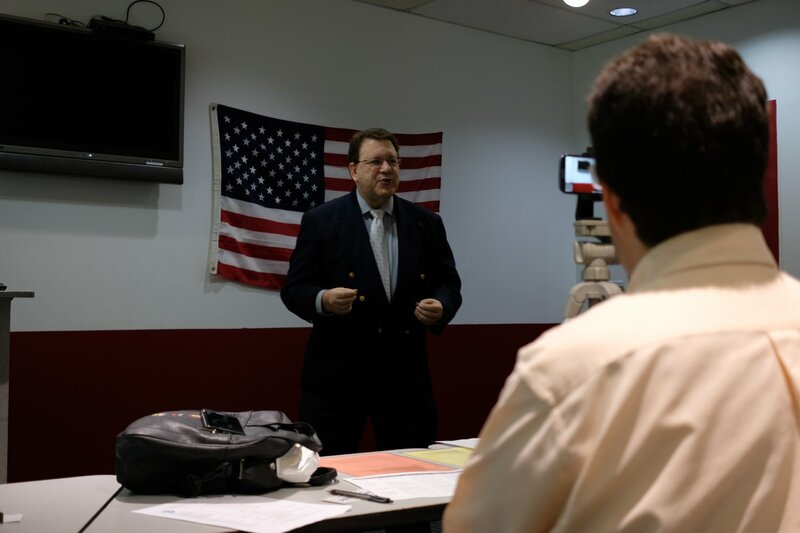 But in the absence of professional quality video equipment and skills, I still think it’s better to record the speeches — and do the best you can, with the equipment you have available — than to deprive the speakers of the chance of having their videos recorded. Particularly at the district level, where the speakers are serious competitors, the speakers are happy to have access to the recording whether they are celebrating a victory or plotting how they will do better next time. To create a public blog post featuring a video, rather than one of these routine members-only posts, just copy and paste the web address for any YouTube video into the WordPress editor. WordPress automatically generates all the code to embed your video in any blog post or web page. This copy-and-paste technique also works with public videos from Facebook and other media sites. When trying to reach viewers on Facebook, it’s possible to post the YouTube link and invite viewers to click through. However, for maximum impact — particularly if you are posting speech videos publicly (with the speaker’s permission) — you should upload them directly to Facebook. Facebook will display videos uploaded to its own platform more prominently, and viewers can watch them without leaving Facebook. In fact, Facebook contacts will see the videos start playing (without sound), and motion tends to catch people’s attention. Another great way of creating online video is with Facebook Live, if you can get the speaker’s permission in advance. My home club will periodically announce that we’re doing Table Topics on Facebook Live, for example, and let members know they have the option of declining to participate. I’ve also suggested Facebook Live as a great way of publicizing the Table Topics and Humorous Speaking contests. Posting club speech videos from your smartphone to a closed group on Facebook would be an alternative for sharing them online, but within a limited circle. The point is not to make anyone famous online before they’re ready to be a video star. I always volunteer that I can “destroy the evidence” if a speaker is embarrassed by what was captured on video. We want to make clear that this is a service we offer to members, not something they’re obligated to agree to. P.S. After seeing this tutorial video, a friend who had been recording a series of Facebook Live videos asked if there was a way of cross-posting them to YouTube. Answer: Sure, you can download your videos from Facebook, then upload them to YouTube or any other video service. You can download Facebook videos by going to the corner of the video and clicking on the 3 dots … then choosing Download Video. From there, you can edit if necessary and then upload to YouTube.